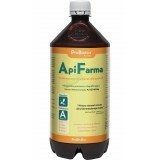 ApiFarma is a natural probiotic preparation for hygienization of equipment, beehives, whole frames including bees and clothes. It pushes away pathogenic microflora and interposes welfare in place of use. It enhances the resistance of development of illness (particularly mycosis). ApiFarma is a natural probiotic preparation for hygienization of equipment, beehives, whole frames including bees and clothes. It displaces pathogenic microflora and interposes welfare in place of use. It enhances the resistance of development of illness (particularly mycosis).